It occurred to me after I created the cards in the last post, that there was supposed to be matching dies for the Stained Glass stamps. I will spare you the details……………………but panic ensued as I could not find the alleged dies anywhere in my craft room. Eventually, they turned up. I am happy they did as they are wonderfully intricate and delicate and are amazing as a complement to the stamp set. The card came together perfectly until I heat embossed the sentiment. I put the moth too close to the flame, as it were, and I warped the vellum a bit. To fix that, I decided to run the card through my Bigshot to flatten it. Bad Idea! It did flatten it a bit, but in the process also flattened the delicate die cut. While it still looks good; it did look better and more dimensional before I steamrolled it. Live and learn. 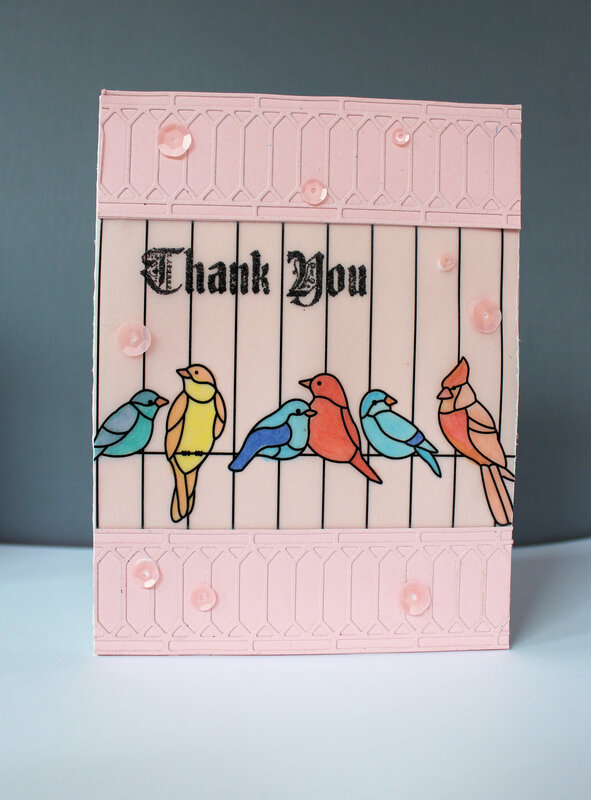 Posted on September 19, 2018, in Card Samples, Oscar's (Deb's) Card Samples and tagged Copics, Stampin Up, Vellum. Bookmark the permalink. Leave a comment.